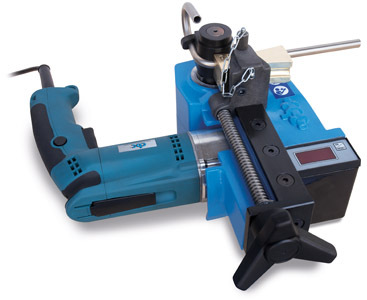 Light and compact tool for pipe bending also on site. We created model FLEX22V, with a display for bending angle for having a more accurate bending results. The pipe's expander is supplied with both models and can be used on annealed copper pipes up to diam. 42 mm. All expanders available on the market can fit the machine. Practical folding stand allows a confortable work and easy carriage. Aluminium standard formers with cast iron hook with bending radius 3 times pipe's diameter from Ø 10 up to 30 mm. 1) Bronze twin grooved guide for pipes from 10 up to 30 mm. 2) Cast iron single grooved guide for pipes from 24 up to 30 mm. 3) Universal roller to be used with thick pipes (3 mm thickness) like gas pipes, with diameter bigger than 22 mm.